For those of us to who love to travel, or have to do it out of necessity, having an organized system is imperative. I am sharing the tips for organized travel that have served us well, as well as the packing checklist that we use. We are a family that truly loves to travel, a trait I surely inherited from my childhood as a Navy Junior. Luckily Terry feels the same way, so we have made it a point to travel with our kiddos as much as possible, both domestically and abroad. While we take many weekend trips, we also tend to do what I call ‘mega trips', which has us away from home for 2-3 weeks at a time. We both work remotely, so we have figured that it makes more sense to go to one area and spend as much time exploring that part of the world as we can. As a result of our many trips, we have packing and trip organizing pretty much down to a science. That being said, there is always something to learn, so I welcome any tip for organized travel you might want to share. I book our hotels at Hotels.com through Ebates.com. I earn points for free hotel stays through Hotels.com and cashback for every stay through Ebates.com. I also shop for other items through Ebates…not just travel. Check the library for travel guides. You may want to purchase one eventually, but this helps narrow down which ones you find most helpful. We have found the community and reviews at TripAdvisor to be very accurate and objective. If flying, check out the best times to buy tickets for the cheapest fares. If traveling abroad, is your passport up to date? 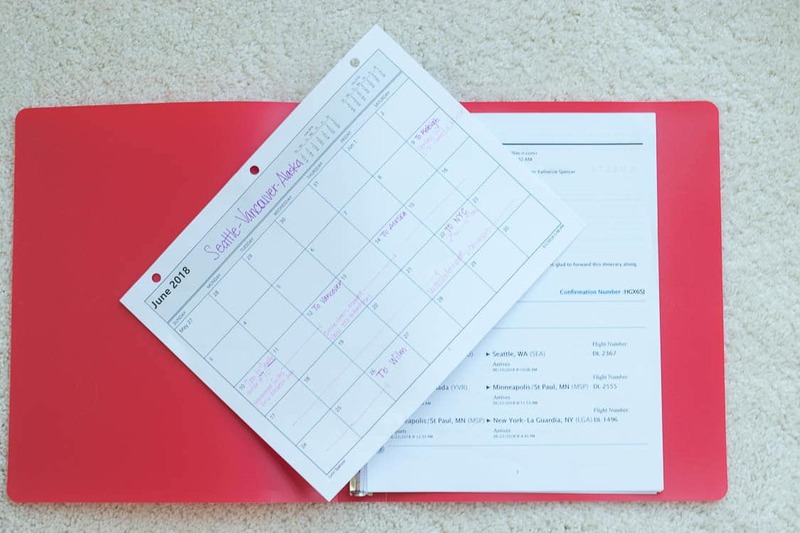 Whether on paper or digitally, designate a calendar solely for your travels. Terry really likes to have the paper, so we print off a calendar noting our flights, hotels, attractions, etc… and keep it in a binder along with copies of our hotel, rental car, attraction and flight reservations. This binder, along with the checklist indicated below, are critical for my family's organized travel. Not to get too personal…but let's talk skivvies. Unless you want to pack a pair for every day of travel (I'm in the clean undies everyday camp) you'll be washing and drying them while on vacay. While I love my cotton skivvies, they don't dry as quick. Buy a couple of pair of quick-drying microfiber underwear, wash them out at night and they'll be ready in the a.m. We use this pegless travel clothesline to hang our skivvies to dry overnight. Wish we would've had these on our hiking trip several years back. When we landed in one of the few hotels with AC, we decided that would be the perfect place to do a bunch of laundry. We had wet skivvies, socks and tshirts for 4 of us strewn ALL over the room (over every lampshade, hanging off of every door, you name it…there was stuff hanging from it) and they still weren't dry 18 hours later when we had to leave. Start checking for books that you might want to take to read. I love finding both fiction and non-fiction books that are set in the areas we will be travelling and reading them both before and during our trips. This site lists books by location. Go ahead schedule any yard care, flower watering or maintenance that needs to be done while you are gone. Also a good time to put in your ‘stop newspaper' request if you receive a paper. Will you need to arrange for someone to pick up your mail? Check to see if oil needs to be changed or any other car maintenance needed. Make sure your GPS can find your destination! We've ended up in the midst of sunflower fields when we put in our lodging address, so if you need a printed map then go ahead and get one. If Travelling Abroad, check with your bank on how long it takes to get the currency you need. I print off the checklists that I have made to help us make sure we have everything we need. One for him and one for her…these are available in the Subscriber Benefits Library. These checklists are an absolute necessity for our organized travel and we really rely on them. If they don't suit your needs, I do recommend that you come up with your own that you can add to as needs be. If driving we take lots of healthy fruit and nuts and water. We will also pack some healthy nuts and similar snacks for air travel. Do you need to make a trip to the grocery store? For trips lasting longer than a weekend, I will bring out our suitcases and start putting stuff in them. This really helps me make sure I have only what I need and that I don't forget anything. I put together outfits, aiming for as many outfits as possible from each clothing item (i.e. I can wear this shirt with my blue jeans, my white jeans and a skirt). Wash anything that needs laundered. If you will be needing dress shirts, take them to the dry cleaner and have them lightly starched and folded. My dry cleaner sends them back with the cardboard insert at the neck band and in a plastic bag. I also put easily wrinkled items in their own plastic bag, it really cuts down on wrinkling. Your pharmacy will mostly likely work with you when you explain you are traveling. Worst case, your doctor may need to call in an extra prescription, which is why you want to get that process started. These little pill bags really make organizing your prescriptions and supplements easy while travelling. Clean out purse and keep only essentials. I will not be taking my everyday purse, opting instead for a smaller cross shoulder bag. I will leave my regular wallet at home, just taking a little coin purse that will hold my ID, Health Insurance Card and a minimum number of credit cards. If travelling overseas, make and take a copy of your passport…just in case. This will help expedite the replacement process if you lose your passport. Keep the spare copy separate from your actual passport. We eat down our fridge, paying particular attention to items which will perish while we are gone. Get your prescriptions doled out for the number of days you'll be gone. If you are taking them out of their original packaging, photocopy or take pictures of your prescription label to take with you. I empty out anything that is in my make-up bag and refill it with what I use on a daily basis. By ‘living out of it' for a day or two before I leave, I am less likely to leave something behind. I use a separate zippered pouch for all my lotions and liquids in case something spills. I get out my clear zippered pouch for all my electronic accessories and start filling it. I printed off a list of common items that I use on clear sticker paper and attached it to the zippered pouch. This pouch, specifically for electronic accessories, helps me keep my accessories in one place and helps remind me to make sure they are all accounted for whenever I leave one space. You can print this out for yourself my clicking on the link under the image below. I use a little jewelry case (similar to this one) to carry my baubles and use buttons to keep my earrings organized and together. If you have an external battery for your phone, get that charged and anything else that might need to charged, like your camera battery. Figure out what you will wear on the day of your travel. Make sure you have a quart-sized Ziploc bag and 3-oz. or less size containers that fit in that bag. Don't forget your neck pillows. If we already didn't have these, I'd splurge on one of these for all the cross-country flights we'll be taking this summer. Allow yourself a 30 minute cushion before you need to leave. No matter that we think we have this organized travel down to a science, something always come up! Have a light on a timer? If there is something you need to pack last minute, set yourself a reminder on your phone to go off 1/2 hour before you need to leave. My daughter often travels with her pillow and we set an alarm to go off before we need to leave hotels to remind us to grab her pillow. What are your tips for organized travel? I'd love to hear them!! If you would like to refer back to this post at a later date, then bookmark this page or pin the following image. Thanks again for spending a few minutes of your busy day with me today, I do hope you can use some of these organized travel tips. 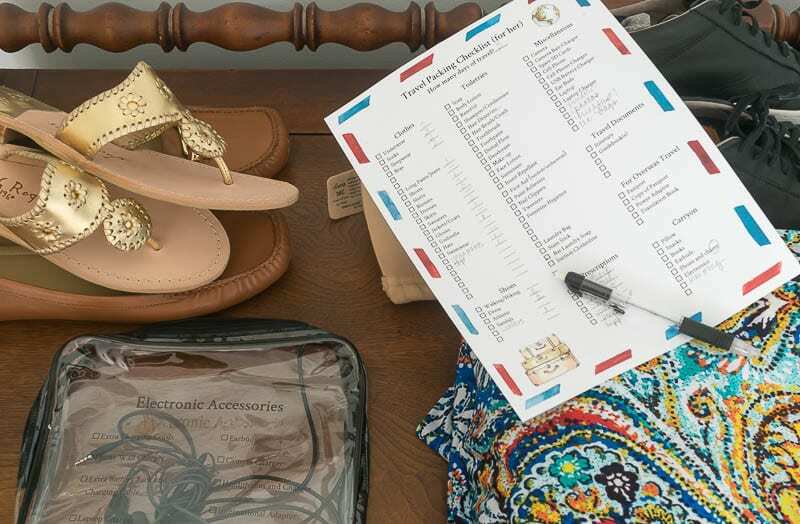 Printables, including the Organized Travel Checklists, indicated above, as well as knit patterns are available to all of my subscribers in the Subscriber Benefits Library. I will continue to add patterns and printables to this page as we go along. Lynn, these tips are wonderful. I love the microfiber undies idea, lol! Thanks for sharing your insight! Thanks Angie…they dry so quickly…which cannot be undervalued when traveling!